The first major live-action television series to feature the zombie apocalypse will likely be sticking around for a while. AMC's The Walking Dead, a television show based off of the comic book of the same name, debuted this past Sunday on Halloween night. The network's effort to create a large-scale television show focused on zombies has paid off, as AMC announced that The Walking Dead debuted with the highest ratings the network has ever seen. The 90-minute episode was watched by 5.3 million viewers, the largest audience for any original series on the network, whose ranks include the popular Mad Men and Breaking Bad. It was also the highest rated cable series premiere of 2010. In case you missed it, Walking Dead feels more like a movie than a television show, which makes sense considering it's being handled by Frank Darabont of Shawshank Redemption and Green Mile fame. The goal of the Robert Kirkman-written graphic novel was to tell a zombie story that didn't end after two hours, and the show reflects this basic idea. It follows Rick Grimes as he wakes up to a world where the dead are everywhere, and some of them are still on their feet. It started off a little slow for me, but it picks up later, and gives what I feel is a more personalized view at how people might handle the existence of zombies. Walking Dead's first season will conclude after 5 more episodes. AMC was rumored to have picked up the show for a second season before it debuted, with future 13-episode seasons planned, but this hasn't yet been confirmed. 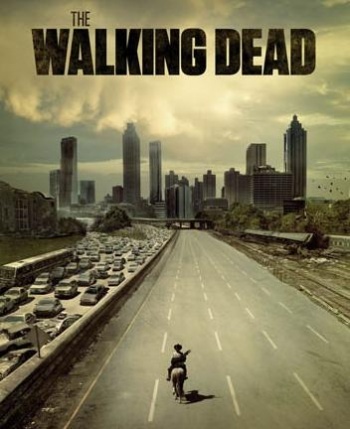 After the massive premiere, I think AMC has the intelligence of a zombie if it doesn't give us more Walking Dead.